On the hunt for a reputable garage door specialist in your area? Looking for a professional repair service at an affordable price? Then look no further, as our team can provide you with a cost-effective solution to any type of problem that's keeping your overhead door from functioning optimally. Whether you’re struggling with a defective door opener, a couple of dented panels, a broken bracket or a snapped spring, we can offer you the perfect fix. If your door slams shut and won't open you may have a broken spring on your hands. As some of the most hardworking parts of your system, the wear and tear your springs go through will gradually take its toll on their coils and cause them to fail. Broken spring replacement is a dangerous task, and best left to our experts. Another possible culprit is the cables. Although these components don't provide the tension required to move the door, they do support its weight, and frayed cables are one of the common problems that homeowners tend to experience. Garage door cable repair is another aspect we specialize in, so if that's the case, rest assured that our team can handle it. The sections that comprise the actual door can be damaged due to a wide variety of reasons. Steel and wooden panels can rust or rot, respectively, which will affect the curb appeal of your home, as well as their ability to keep it secure. Wood can also warp and swell, and an aluminum door can easily dent and may even break. Not to worry, though, as our technicians can expertly remove any affected panel and replace it with one of a matching color and design. Unfortunately, the potential troubles don't end here. 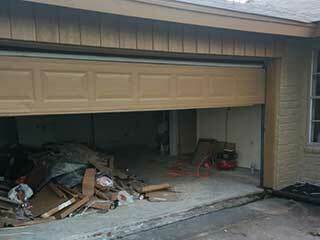 Your electric garage door opener can also experience its fair share of problems. Its motor gear can wear out, its drive-system can break and even the circuit board that essentially functions as the "brain" of the motorized unit may get fried or become detached from some its wires. If something like this happens, count on us for assistance. We work with major manufacturers like Lineal, Chamberlain, and Amarr, so we are well versed in fixing models of all of the industry's leading brands. No matter what type of problem is affecting your system, our experts at Garage Door Repair Spring can fix it. Don't hesitate to contact us whenever you need our professional technicians to come and help us out.